“The Longest Ride” tells the story of two couples in North Carolina. The first is about Ira Levinson, an old widow who became stranded after crashing his truck down an embankment. While struggling to stay alive he relives the memories of his late wife Ruth and we get to experience the love they had and how they came to spend their lives together. The second follows the story of a young couple Sophia Danko, a college senior at Wake Forest University, and Luke Collins, a cowboy and Champion bull rider. After meeting during a rodeo after-party, they begin to fall in love, but both have different paths and their love is tested. They have life decisions to make and put them aside until they finally have to face them. This book shows you the beginning and end of life with another person. It’s like the “I Do” and “Till Death Do Us Part” combined into one book. It’s about making memories and looking back on them for comfort and joy. It’s about sacrifices a person makes in order to make a relationship work. While the book seemed to be primarily about Sophia and Luke, I really enjoyed Ira’s story. It’s sad how he’s remembering his wife while trying to stay alive long enough for someone to find him, but the stories told about their life together makes me feel that true love really does last forever. At ninety-one, the crash left him with injuries that made him immobile and struggling to stay awake. This is when his subconscious brings his beloved wife, Ruth, back to him. Ruth asks him to tell her about significant moments in their lives like when they met, when Ira went to war, his proposal, and their honeymoon. All in an effort for him to hold on just a bit longer because he still had unfinished business to do. The more I read about Ira, the more I realized that it’s the simple things in life that are important. I think this is one reason Ira was one of my favorite characters. The relationship he had with Ruth seemed real, not some fairytale romance. There were ups and downs, but Ira and Ruth worked through even the toughest of times. This is something that many marriages fail to do these days…fight to keep love alive. There were two significant times during Ira and Ruth’s relationship that truly tested them. The first is when Ira returned home from serving in WWII. Before going off to war he had proposed to Ruth and it was completely lacking romance. Not in the sense that Nicholas Sparks didn’t add enough romance to the proposal, but Sparks created Ira as a man who has a tough time being romantic, which is how many men are. However, even seemingly unromantic men can surprise you. Keep that in mind when you read this book. Ira had returned home as a wounded solider. He was in the hospital for a few weeks recovery from gun shot wounds during an air raid. Doctors thought he wouldn’t survive especially since he developed peritonitis and had a severe fever for thirteen days. When he returned, he broke off the engagement to Ruth. Of course Ruth was heartbroken…what woman wouldn’t be? She didn’t understand why he had made this decision, but months later he finally told her. Due to the peritonitis it was likely he couldn’t have children. Ira knew that having a child was something Ruth really wanted in the future and he didn’t want to deprive her of that. He thought the right thing to do was to let her move on with someone that could give her exactly what she wanted. This is when Ruth had to make the decision to stay or go…she stayed. Ira should have told Ruth right from the beginning the reason they shouldn’t get married. It’s worse to leave a woman in the dark because she wonders, what did I do wrong? But I also see Ira’s side of the story. It’s a painful feeling knowing you can’t give someone you love exactly what they want. But I was glad that he finally had the courage to tell her, considering how much he loved her. The second most trying moment for Ira and Ruth was many many years later. They still had no children and Ruth was a school teacher where children came from very poor families. That’s where she met Daniel who became the son she never had. They were contemplating adopting Daniel, but after coming home from their yearly anniversary trip Daniel was gone and she never found out where he had been taken. It’s not until much later in the book that you find out. Ruth took this terribly and their marriage was in turmoil. Ira thought that it was ending between them. What you don’t know yet, about Ira and Ruth, is they had started collecting art pieces during their first honeymoon. They would take a yearly trip to Black Mountain College or exhibits in various places, where they would buy artwork from young upcoming artists. By the time Ira was stranded in his truck he was worth millions and millions of dollars based on their art collection. This is an important part of the ending because Ira and Ruth never sold one painting….they kept them. That meant Ira had to decide where they would go once he was gone. Now, I want to turn the attention over to Sophia and Luke. I believe they embody what being a young couple is about. Everyone has been in the phase when you try to spend as much time as possible together because it’s so new and exciting. That’s what was going on with Sophia and Luke. But they both had things that troubled them. Sophia was worried about school and what would happen after she graduated. From personal experience, when you’re in college things are really put into perspective about where you want your life to be going. Sophia was no different. She was starting her senior year as an art history major and wanted to end up working in a museum. Sophia’s struggles are like many college students preparing to graduate. Studying for finals, applying for jobs or internships, and essentially dealing with the fear of the unknown because nobody ever really knows what will happen after graduation. Luke is on the complete opposite spectrum of Sophia..but there’s a phrase “opposites attract”. He never went to college and had no plans to go in the future. All he knew was farming and bull riding because that’s how he grew up. Tending to cattle, growing and harvesting pumpkins, and bailing hay were just some of the daily chores Luke grew up doing. He was also a very good bull rider. He was well known in the sport, but a little over a year before he met Sophia, Luke had a terrible accident. When Luke finally told Sophia just how serious this accident was she gave him an ultimatum. He had to choose between Sophia and riding. I did understand the internal struggle Luke had with this because he wasn’t riding again for the glory. He was riding so that his mother wouldn’t lose the farm. The money he won helped pay bills that were overdue and mortgage payments that would eventually double. It was like he had to choose between Sophia and his mother. Sophia did have a good reason to give Luke an ultimatum. Riding would most certainly kill him. Bull riding is dangerous to begin with, but the injuries he sustained a year before increased his chances of death substantially. This is why I believe Sophia made the right decision. Thankfully, right before an important ride, Luke makes the decision…he chooses Sophia. I know you’re probably wondering if Ira makes it, which was what I was thinking through most of the book. A good thing because it kept me on my toes and wanting to read more. I’m going to tell you that yes, Ira does make it and guess who found him….Sophia and Luke. Ira didn’t last too much longer…but he asked Sophia to do one thing for him. He asked her to read a letter that he had written to his wife. This is when I was tearing up. Now, I don’t want to give away the ending, but I will say that you may or may not know what’s coming. I certainly figured out what was coming, but that didn’t take away from how sweet it was. I will say that you shouldn’t forget about the large estate of paintings Ira had left. In the end, everyone got what they needed and things turned out right. While Ira did pass on, he was able to join Ruth again…something he truly wanted. Luke got more than he ever dreamed of, which would change his life and that of Sophia’s forever. All four main characters, Ira, Ruth, Luke, and Sophia were giving up something in order to have something worth so much more….the chance to have a life filled with love and happiness. I believe this is what the book was striving for. 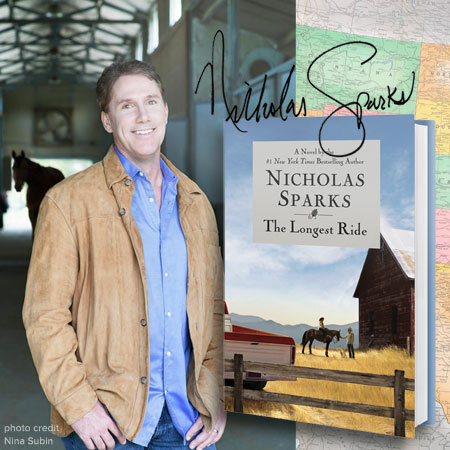 From a scale of 1-10 I give “The Longest Ride” a 9. This book didn’t have as much of an emotional impact on me as others he has written, like “The Last Song”. I literally was bawling reading that book, but this one is still very good. I would recommend this book to those who enjoy love stories and are hopeless romantics like myself. Let me know what you think or if you have any book recommendations by leaving a comment. I like your favorite quotes feature. I think I will add some quotes to my next review. Hi Danielle Thank you for following my reviews on ireadnovels.wordpress.com. I have put your name of your wordpress site on my ireadnovels.wordpress.com so that book lovers can find your fab wordpress site and follow your reviews too. Best wishes from ireadnovels.wordpress.com. Hello Danielle. Lovely review. I have a question. I haven’t read the book but just saw the movie adaptation. I don’t understand what made Luke choose to buy the ‘Portrait of Ruth’. Perhaps there’s some detail the movie might have left out. In the movie he (Luke) had very little interaction with Ira. Your thoughts will be greatly appreciated. PS. I loved the movie nonetheless. Hi Ore, Thanks for reading my review. It’s such a great book. I’m embarrassed to say I haven’t seen the movie yet. As for your question, Luke decided to buy the painting because he wanted to get something for Sophia and the ‘Portrait of Ruth’ was the only one he could afford…until he actually received all of it. Hope that answers your question. It’s one of my favorite Nicholas Sparks books because it’s a combination of two different love stories. Oh I see. In the movie, he is shown mentally piecing together facts which seemed to influence his decision to buy the portrait. I have to read an adult book for my English honors class would the longest ride be considered as a adult book? In the book, he just wanted to get the portrait for Sophia because he knew it would mean a lot to her and it was the only one he could afford. So no, Ira did not tell him to buy the portrait.